There are always a few simple, unstressed meals put together from what is available in the kitchen and fridge during the week. Leftover chicken will find its way into a pasta or risotto. Making this risotto follows the same methodology as others on the site. The critical factor is judging when to put ingredients into the rice – if they are put in too early they might break-up from the vigorous stirring; or if too late, they may not lend any flavour to the rice. If possible try using some part of the ingredient to flavour the stock. With this risotto I pre-cook the chicken and courgettes in plain water which will then be flavoured for use in the risotto. I add the chicken and courgettes at the end of cooking. Mrs WDC always cooks her chicken risotto with just a hint of added chicken. This baffled me because I wanted a proper portion of meat. 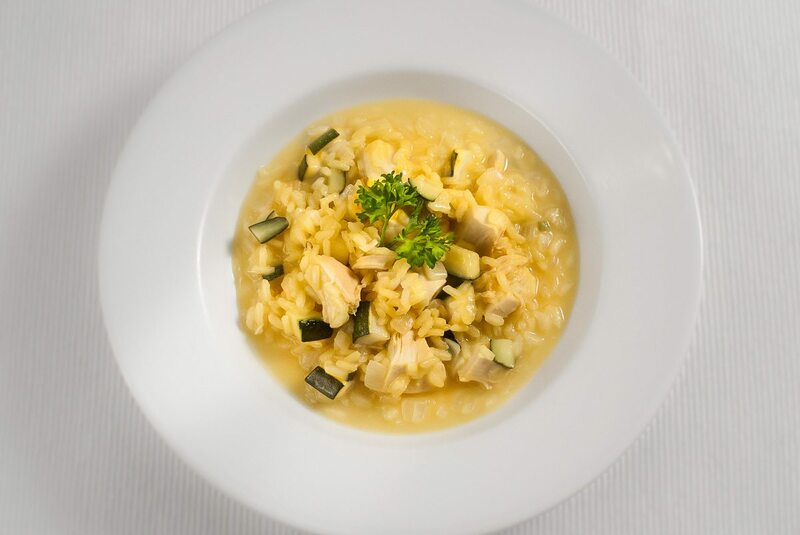 But a risotto is not intended to be served with large chunks of meat – it’s more about the rice, the added ingredients are indeed hints of flavour. NB: This risotto is ideal for turning into arancini. You will need to make sure you will have some left overs. Cool the rice quickly and put in the fridge for making arancini the following day. Heat the stock. Put the stock into a pan and bring to a simmer. Add the saffron and keep the stock hot. Pre-cook the courgettes. Put 500ml of water into a sauce pan with lid and bring to the boil. Wash and chop the courgettes into pieces. Boil the courgettes for no more than 5 minutes – just until they start to lose their opaqueness – they should still be quite firm. Drain reserving the water and put to one side. Pre-cook the chicken. Cut the breast fillets in half along their length. Put into a sauce pan with lid and pour over the reserved courgette cooking water. Bring just up to a simmer and cook for no more than 5 minutes. Remove the fillets with a slotted spoon and place on a plate. Strain the poaching liquid and add to the heated chicken stock. Put the chicken to one side. Saute the onion and celery. Using a sturdy thick-bottomed or cast iron pan, cook the celery and onion in 25g of butter and a tablespoon of virgin olive oil. Cook on a medium heat for 10 minutes. Add the rice. Cook for 5 minutes, stirring all the time. Add the wine. Stir until it has evaporated. Add a ladle of strained hot stock. Cook the rice. Stir the rice until the stock has all but evaporated. Tedious, I know. The stirring releases the starch from the rice and gives it its creamy consistency. So put the radio on… find a high stool… and keep stirring! The idea is to let each ladle of stock become absorbed before adding more. This will take about 20 minutes. Add more boiling water if necessary. After 15 minutes add the chicken and courgettes. Now stirring more gently. Test the rice. Test a grain – if it has a slight crunch in the very centre it is almost ready for finishing. Ensure there is plenty of moisture in the rice. The texture should be creamy – not stiff – not runny. There will be a resting period and this will tend to stiffen the mixture, so it is safe to make it a little wetter. Finish the risotto. Add 25g butter and the Parmesan (this is the ‘mantacatura’ – for purists…). Check the seasoning and add a little more stock if needed. Put the lid on the pan and let it rest for 5 minutes. Serve. Stir the risotto one last time. Make any further adjustments to seasoning. Serve onto each plate and add some parsley as a garnish. More Parmesan can be added at the table.